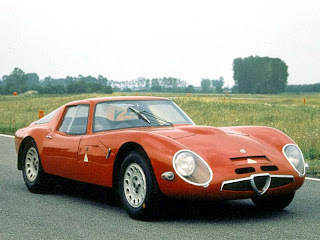 The Alfa Romeo Giulia TZ (also known as the Alfa Romeo TZ or Tubolare Zagato) was a small sports car manufactured by Alfa Romeo from 1963 to 1967. 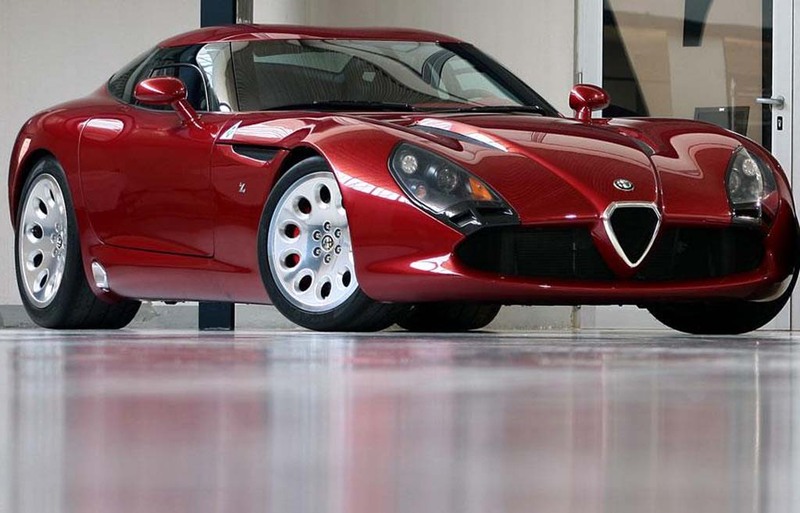 It replaced the Giulietta SZ. 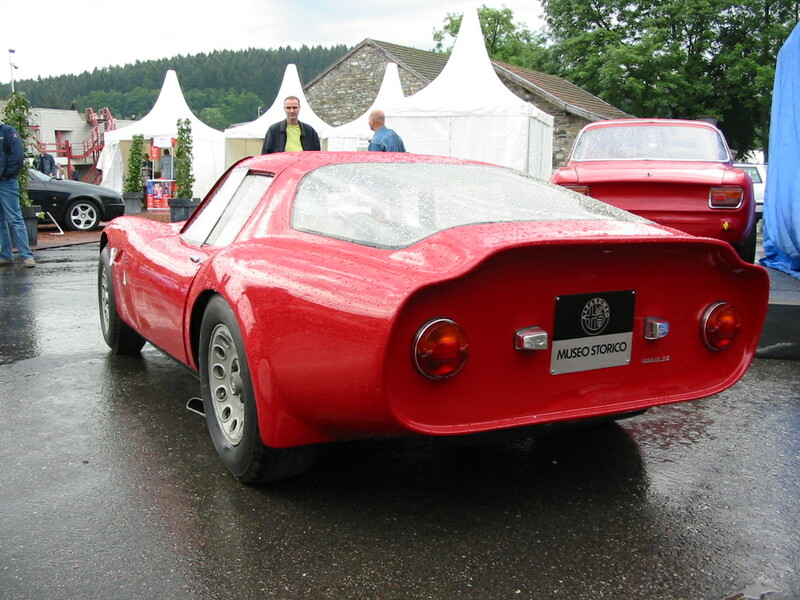 The original TZ, currently sometimes referenced as TZ1 to differ from later TZ2, was developed in together with Autodelta, a company led by Ex-Ferrari engineer Carlo Chiti. 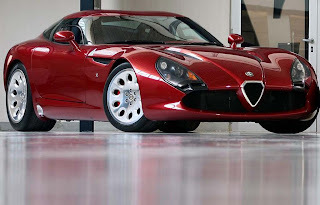 It featured a 1,570 cc twin cam engine and other mechanical components shared with the Alfa Romeo Giulia and carried a 105 series chassis number, but was a purpose built sports racing car, with a tubular spaceframe chassis, light all-aluminium bodywork, disc brakes and independent suspension. The result was a lightweight coupé of only 650 kilograms (1,430 lb) and top speed of 134 miles per hour (216 km/h). The TZ was built both for street and racing trim, with the latest racing versions producing up to 160 brake horsepower (120 kW). Alfa's twin-spark cylinder head, as also used in the GTA, contributed to the speed of the TZ; the standard Giulia alloy block with wet steel liners was installed at an angle under the hood of the TZ to improve airflow. Aiding the TZ in its quest for performance was the treatment of the rear bodywork. Incorporating the research of Dr. Wunibald Kamm, the TZ used a style called "coda tronca" in Italian, meaning "short tail. ", otherwise known as the Kamm tail. The principle is that unless you are willing to incorporate an aircraft-like extended tail (not practical for an automobile), there is surprisingly little, if any, increase in drag and a marked decrease in lift or even some downforce by simply chopping off a portion of the tail. 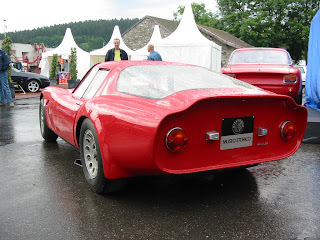 Zagato had previously proved the success of this tail treatment in their "coda tronca" Sprint Zagato sports-racing cars, and it was a natural evolution to adapt this to the Giulia TZ. The car debuted at the 1963 FISA Monza Cup, where TZs took the first four places in the prototype category. At the beginning of 1964 the TZ was homologated (100 units were needed for homologation) to the Gran Turismo category. After homologation it started to take more class wins in Europe and North-America. Of the first TZ, 112 units were built between 1963 and 1965. Only built as limited amount these TZ models are quite collectibles nowadays, listed price around 150,000-200,000 US dollars. In 1965 the car was updated with new fibreglass bodywork providing lower drag and reduced weight (620 kg). This new version was also made by Zagato. 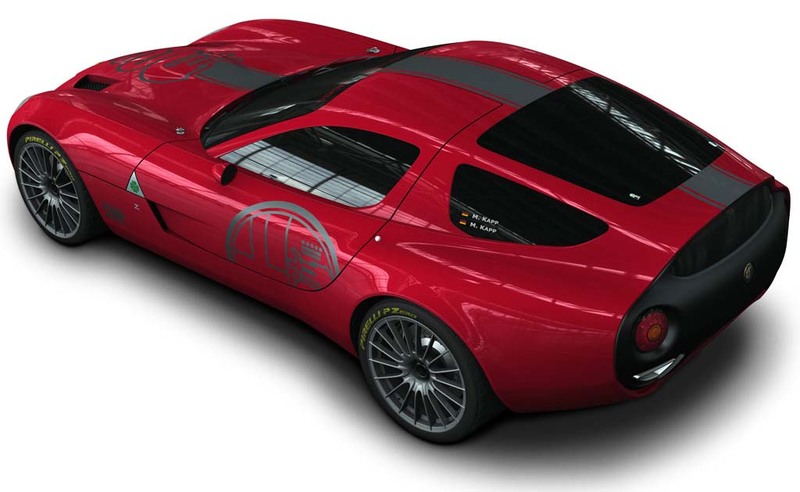 The new design was called the Alfa Romeo Giulia TZ2. The TZ2 was only built as racing version with Autodelta prepared twin plug, dry sump lubrication engine producing around 170 brake horsepower (130 kW). With this engine the car reached top speed of 152 miles per hour (245 km/h). The rear window was also changed, now single unit rather than three part window in TZ. Development of TZ cars was stopped in the end of 1965, to make room for new GTA racing program. Only 12 TZ2's were built. 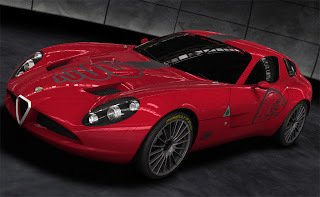 The car won the prestigious Gran Turismo Trophy at the 2009 Pebble Beach Concours d'Elegance, and has been re-created for use in Gran Turismo 5. To celebrate Alfa's 100 years, Zagato designed a one-off car that was first presented and won the 2010 edition of the Concorso d'Eleganza Villa d'Este in Italy. The car weights 850 kg (1,874 lb) thanks to its carbon fiber frame and hand beaten aluminium body and has 420 hp (313 kW) dry sump V8 4.2 litre engine. 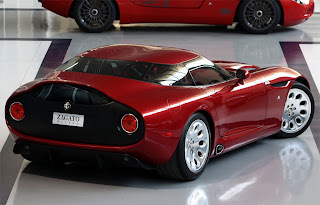 The car has a 6-speed sequential gearbox, it reaches a top speed of over 300 km/h (186 mph) and it can accelerate from zero to 100 km/h (62 mph) in 3.5 seconds. 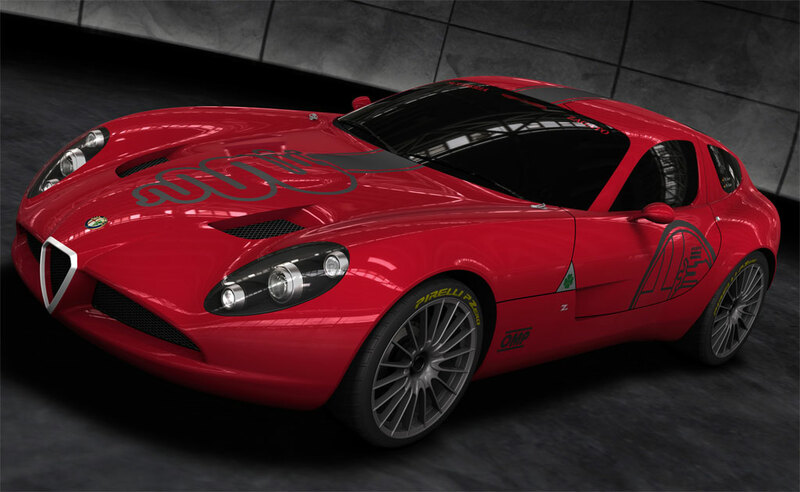 On April 28, 2011 Zagato unveiled a TZ3 Stradale (road) version of the TZ3 based on the Dodge Viper ACR-X. It is powered by the Viper's 8.4 liter 640 hp (477 kW) V10. Only nine units will be made. 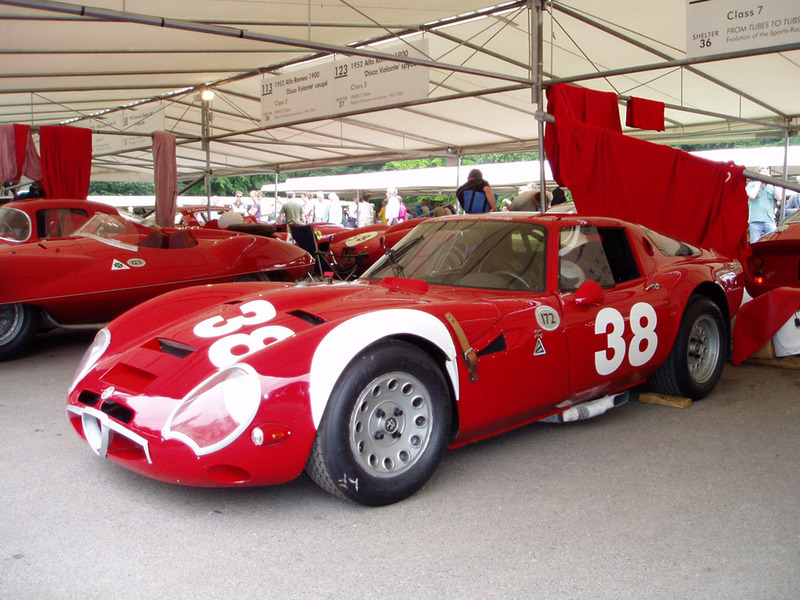 TZ3 Stradale was designed by Norihiko Harada. Last updated on 14 March 2014 at 00:44.